Polish nationalists say anti-Semitism has been used to shame Poland, but historians and Jewish leaders say they're trying to censor the truth about the Holocaust. Poland infuriated Israel ahead of last weekend's Holocaust Remembrance Day when its Parliament took up a bill to make it a crime to blame Poland for the Holocaust. But it doesn't stop there. The bill's full text says it would broadly make it a crime to accuse the Polish state of "other crimes against peace and humanity, or war crimes," or to "grossly [diminish] the responsibility of actual perpetrators" of such crimes. After passing Poland's lower house last week, the Polish Senate approve the bill on Thursday. It still has to be signed by the president to become law. “We will under no circumstances accept any attempt to rewrite history,” Prime Minister Benjamin Netanyahu said in remarks to his cabinet on Sunday. Netanyahu also called Poland's prime minister to protest the legislation. Many historians and Jewish groups inside Poland denounced the bill as well. "We consider the adopted law a tool intended to facilitate the ideological manipulation and imposition of the history policy of the Polish state," said a statement from the Polish Center for Holocaust Research. "The new legislation would constitute an unprecedented (and unknown in a democratic system) intrusion into the debate about the Polish history." Polish Prime Minister Mateusz Morawiecki defended the proposal, tweeting that “Auschwitz isn’t a Polish name and Arbeit Macht Frei isn’t a Polish phrase,” referring to the motto engraved on Auschwitz's gate. Morawiecki also reportedly said the law was comparable to an Israeli law making it a crime to deny the Holocaust, saying, "Israeli law also has similar solutions to those who deny or underestimate the severity of the crimes committed against the Jewish nation." The bill, which passed the lower chamber of Poland's Parliament, seeks to forbid calling Auschwitz and other Nazi facilities "Polish death camps." Many Poles are infuriated when Nazi concentration camps are referred to as "Polish," because they were built and run by Germany in occupied Polish territory. Around 150,000 ethnic Poles are estimated to have been imprisoned in Auschwitz, along with more than 1 million Jews and tens of thousands of members of other groups. 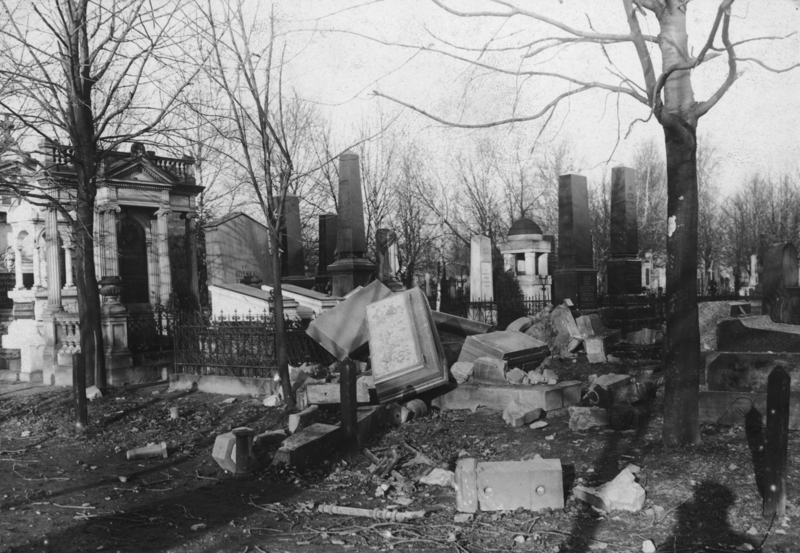 Poland is generally estimated to have lost 6 million people during World War II; about half of the dead were Jews, the rest Poles and members of ethnic minority groups. Thousands of Poles have been recognized by the World Holocaust Remembrance Center in Israel for helping rescue Jews during the war. Many Polish nationalists believe previous liberal governments went too far in confronting anti-Semitism in Poland's past. This bill is part of rolling back what they call a "pedagogy of shame" designed to make Poles feel bad about their history. "We reject the policy of the pedagogy of shame," said Jarosław Kaczyński, head of the ruling Law and Justice Party, last November. "We are moving towards Poland, which will be able to say is an independent and proud country." 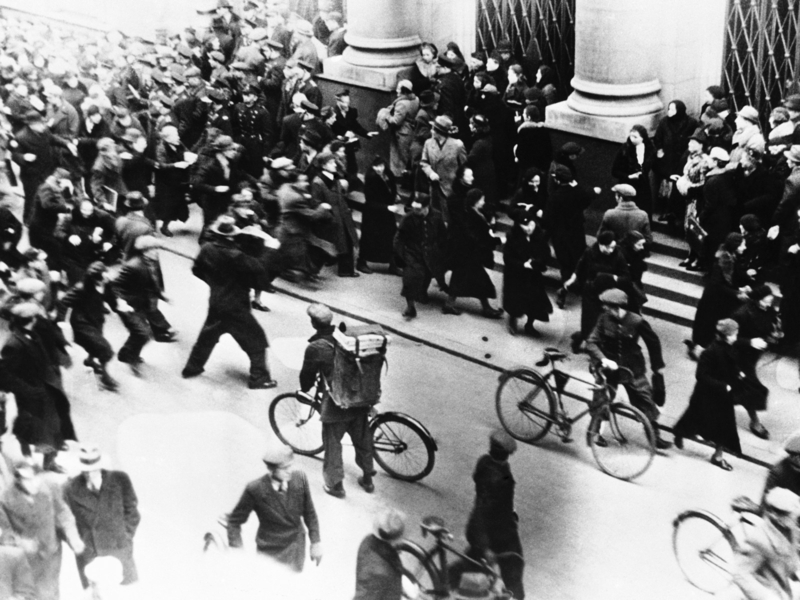 While there were many Poles who helped Jews during the war, there were also dozens of incidents where Poles attacked Jews after the Nazis invaded. 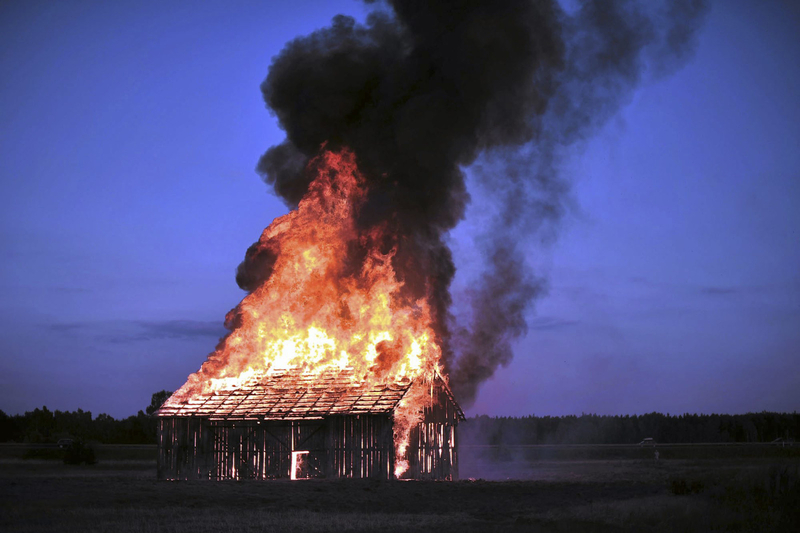 The most famous of these incidents was a 1941 pogrom in a town called Jedwabne, in which a group of Poles trapped around 300 Jews in a barn and set it on fire as Nazi soldiers looked on. On the 60th anniversary of the massacre in 2001, Poland's then-president Aleksander Kwasniewski apologized for the event and others like it that occurred during the war. "We know with all the certainty that Poles were among the oppressors and assassins," he said, adding that Poland had "become aware of the responsibility for our attitude towards the dark pages in our history." According to the POLIN Museum of the History of Polish Jews, this was one of dozens of pogroms that broke out as Nazi troops advanced across Poland. The incident became well-known in Poland thanks to a book by American historian Jan Tomasz Gross, in which he described the event unfolding as "half of the Polish town of Jedwabne murdered the other half." 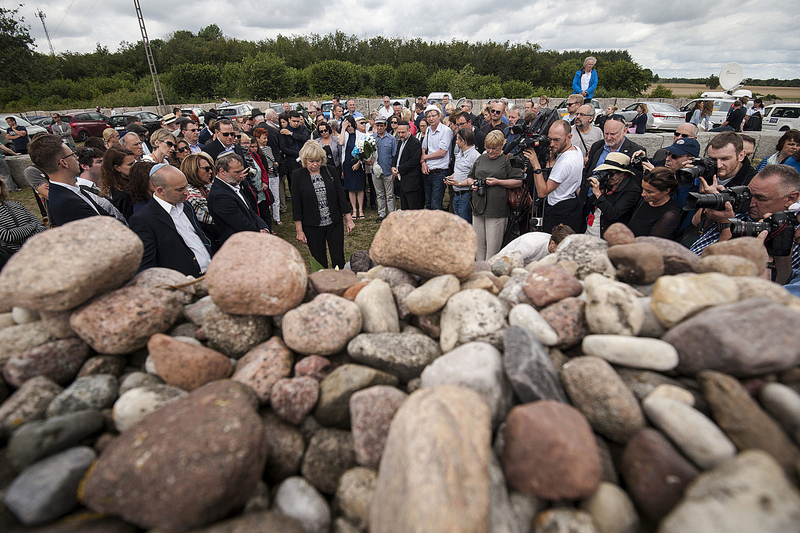 An investigation by Poland's Institute of National Remembrance concluded that only a fraction of the town's Polish population participated. It also called into question his conclusion that the total number of Jews killed that day actually totaled 1,600. A survey conducted after the book's publication found half of Poles surveyed were familiar with the incident, and 40% approved of the president's 2001 remarks. But historical debate over Gross's account has more recently transformed into allegations that Poles were never involved in the massacre at all. In 2016, the education minister from the Law and Justice Party told an interviewer the claim that Poles were involved in the pogrom was just "opinion," and she also would not say Poles were responsible for a 1946 pogrom that occurred in the town of Kielce after the war's end. Poland also had its own anti-Jewish movements before the war. There was a wave of pogroms targeting Jews in Polish small towns in the 1930s as nationalist parties jockeyed for power, and professions like doctors and engineers voted to restrict membership in their professional associations only to "Aryans." Many universities established segregated seating for Jewish students, which became known as "ghetto benches," writes historian Antony Polonsky in his book, The Jews of Poland and Russia. Though modern Poland had been established as a multi-ethnic state — only two-thirds of its citizens were ethnic Poles at the time it became independent in 1918 — there was a major push in the 1930s to get Jews to leave the country. Poland's representatives to the League of Nations tried to win international support for mass emigration from Poland, claiming the "Jewish Problem" required "rapid measures of relief." A committee of Polish experts even went to Paris to propose a scheme to relocate Jews to Madagascar, which was then a French colony. This was a proposal also considered by the Nazis before settling on the policy of mass execution. 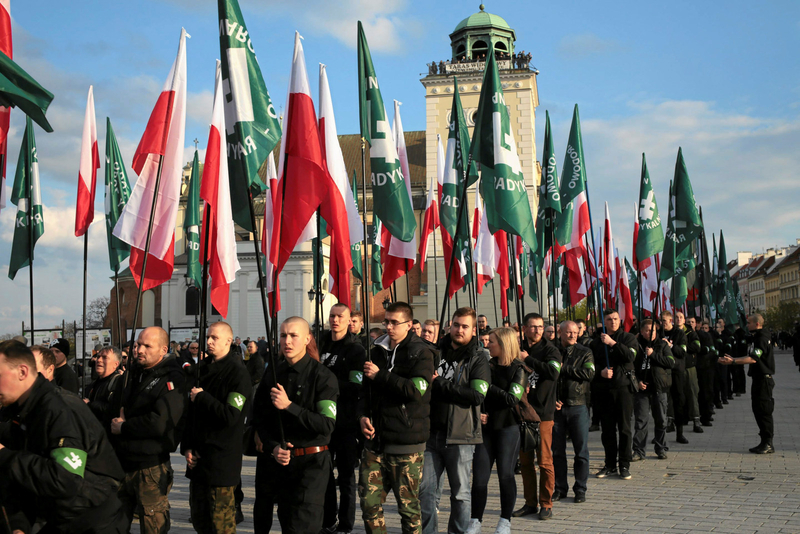 A rally called "Nationalists defending the Truth" is being planned for Wednesday in front of the Israeli embassy in Warsaw. It's co-organized by self-described "authoritarian" and "racial separatist" groups that take their names from nationalist groups active in the 1930s. 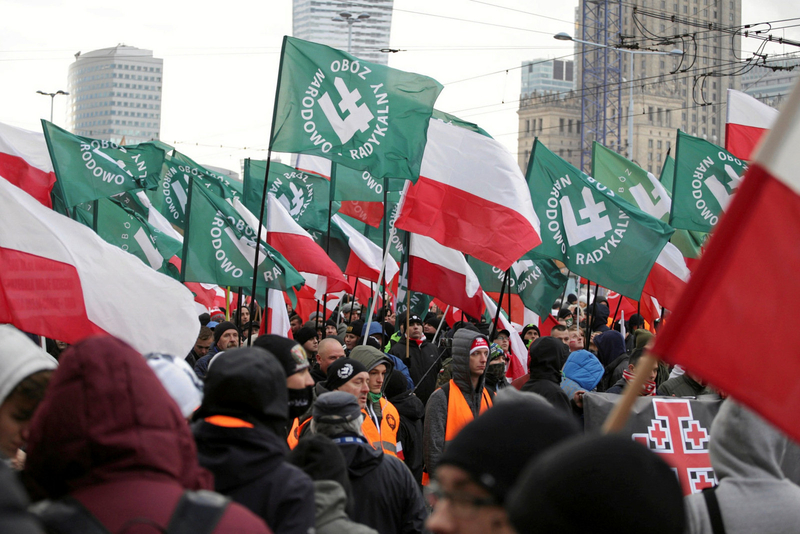 These groups include the National Radical Camp and All-Polish Youth, which also co-organize the annual November march in Warsaw marking Poland's independence day. Their 2017 march drew tens of thousands to the streets for a march kicked off with speeches by self-described fascists. Some marchers carried banners of the Celtic cross — a Nazi symbol — and featured racist slogans. The clash with Israel comes just after TVN, an independent broadcaster in Poland, caused uproar with a documentary about an organization that organized a celebration in honor of Hitler's birthday and engaged in other neo-Nazi imagery. One man involved in the group is an aide to an MP named Robert Winnicki, the leader of the most extreme right-wing party in Parliament, the National Movement. The rise of these groups is stunning, said Dariusz Stola, director of the POLIN Museum of the History of Polish Jews, in an interview earlier this month. "Six years ago, I didn’t expect that you would see neofascist people praising a Polish fascist organization marching in the main street of several cities or present in church with their flags," he said. The bill that passed the Polish parliament seeks to forbid referring to Auschwitz and other Nazi camps as "Polish death camps." A previous version of this article said the bill specifically bans the phrase.